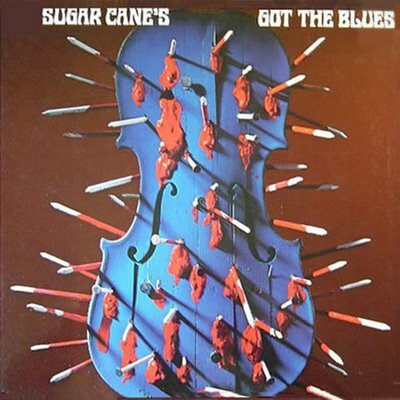 Sugar Cane’s Got The Blues — I Don’t!!! The two CDs I ordered from the German label, Promising Music, on April 20th, arrived this afternoon. Talk about speedy delivery. I was expecting 4 to 6 weeks. I was pleasantly surprised to say the least. To start, everything they say about their reissues is correct: the CD packaging does resemble the gatefold albums of the era, right down to the grooves in the CD, and the vinyl record sleeve itself. Even the liner notes have been recreated and translated from the original German into English for us uni-lingual folks. In the final analysis, though, it’s not what they look like that matters, but how they sound. Restauration of the basic material as close to the original as possible. We give the integrity of the original sound top priority. By that we rather turn down an extreme reduction of tape noises (e.g. we feel, in case of doubt, leftovers of tape hiss less disturbing than a limitation of the sound transparency), and we edit the acoustic patterns carefully on the basis of original aesthetics (i.e. no “pseudo stereo” sound, no artificial reverbs, no additional compression, no superimposed “modern” sound scapes). We remastered the original MPS master tapes digitally on a 24bit/88,2kHz level. By this we feel to reach, in comparison to a sampling rate of 96kHz, a more transparent and smooth sound, as the down sampling to the regular 44,1kHz Compact Disc standard runs much more plain and straight. By this we produce pristine, true-to-original listening pleasure of these precious recordings at highest possible quality — not high tech sterility. While neither are vinyl records, I use the same test with these CDs as I do with all the vinyl records I purchase: do they possess a deep, warm enveloping sound as opposed to a sound which is harder and more artificial? Both CDs are excellent remasterings of these early MPS titles. While, admittedly, this was my first listen to Don ‘Sugarcane’ Harris‘ Sugar Cane’s Got the Blues, the electrifying performances recorded at Berlin’s Philharmonic Hall from November, 1971, were rendered richly and vibrantly. I have heard digital copies of vinyl rips of George Duke’s Faces In Reflection, though, and this CD blows those mp3s out of the water. It’s like listening to a brand new album (which it is, in many respects). A joy in any language. The last time I entered an independent music store and asked if they had anything by George Duke in stock, the response I received was a very long, dull, blank stare followed by: “George who?” The same goes for the many of the Zappa alumni from the early to mid-70s. It’s as though they’ve been completely forgotten by the present music store owners and their databases. One cannot completely fault them, though, as much of the music from that period is out-of-print, or has never been issued on CD. Luckily, a small German label, Promising Music, has gained access to a range of more than 400 titles of the MPS catalogue (which is owned by Universal Classics & Jazz, a division of Universal Music GmbH, Berlin/Germany). They have reissued Don ‘Sugarcane’ Harris‘s classic Sugar Cane’s Got The Blues and George Duke’s Faces In Reflection, (both of which I have already gleefully ordered) with intentions of reissuing other Duke classics such as ‘I Love the Blues, She Heard My Cry’, ‘Feel’, and ‘Liberated Fantasies’. All promising music releases are as close to the vinyl original as a CD format can be. Until the CDs arrive, in particular the Sugarcane reissue, I can satisfy myself listening to the five RealAudio excerpts of Don ‘Sugarcane’ Harris available for free download here.